Assessing the damage – Part 1 – 5 Nov 2014. A friend has lent me his bike jack so I can take a closer look at the S3. Rhino is occupying the bench. The big bungy strap is holding the stand out till I can reattach the springs. 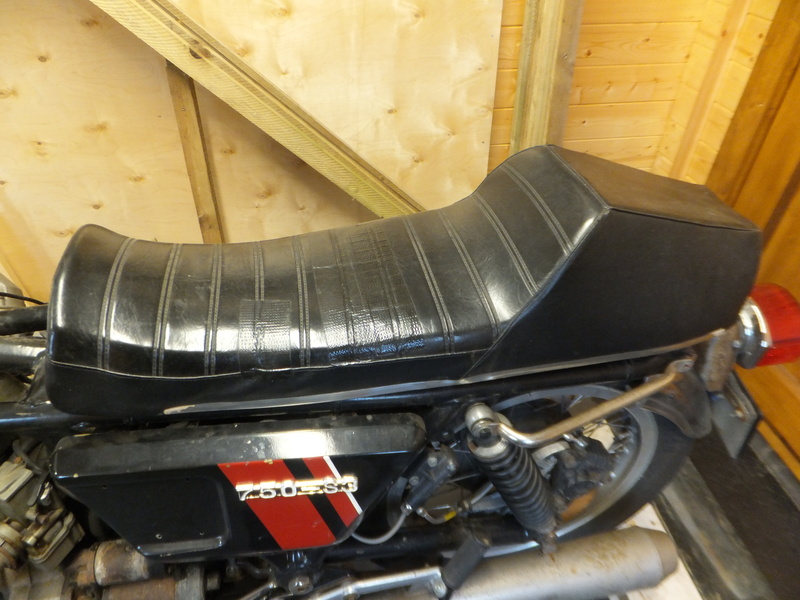 First thing I did was to take the seat and fuel tank off so I could get a proper look at the frame. It’s a sorry sight and is definitely bent. 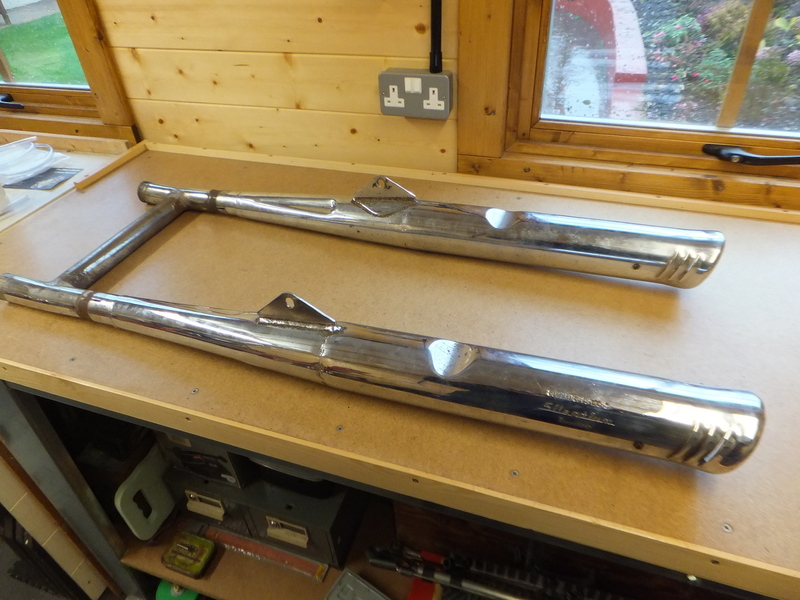 The long frame rails from the steering head to the rear mudguard mount are both bent in front of the gussets above the carburetors. The top frame rail is twisted which is why the ignition switch had moved to nearly touch the fuel tank. 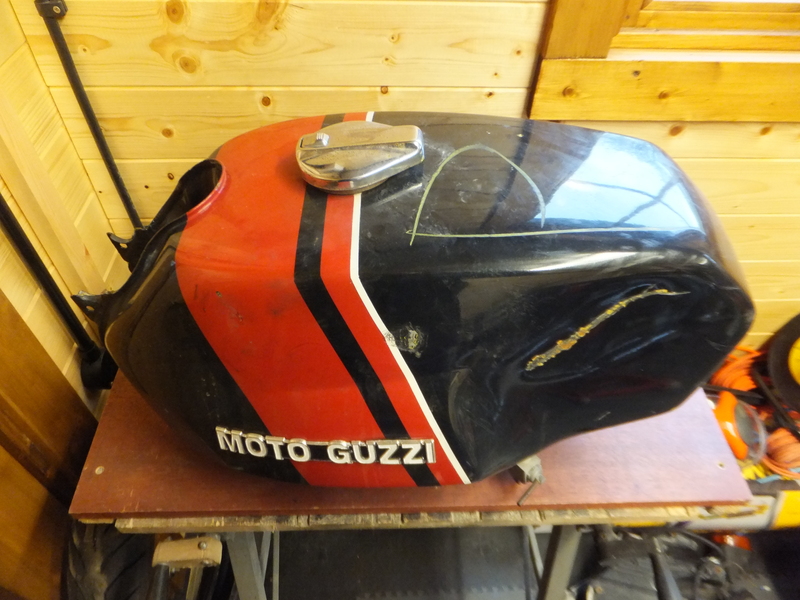 General opinion on the Guzzi forums is that the frame could be straightened provided there are no creased tubes and I can’t find any. However it is well out of shape. I think the two frame rails which go down from the steering head to the front engine mounting bolt are bent as well. 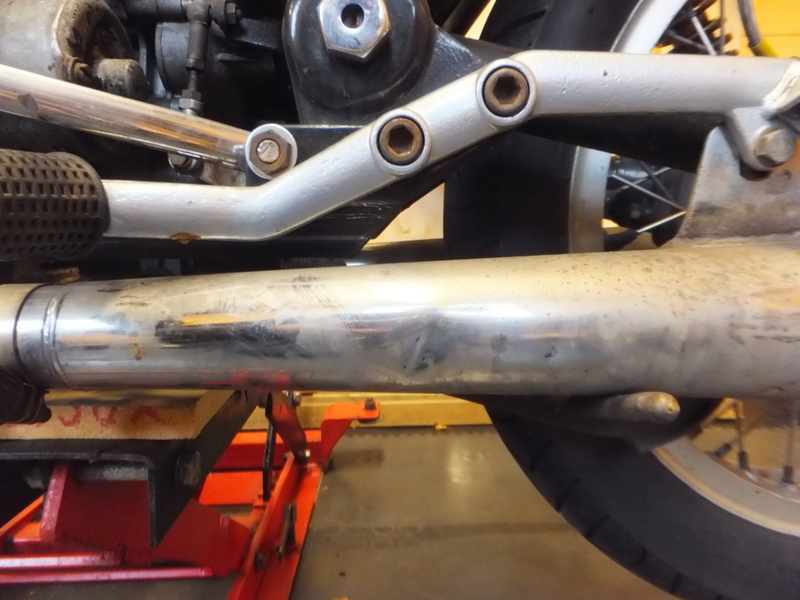 I think that, although both the fork yokes look to be in one piece, the steering stem is probably bent as I can see the lower head bearing. The front wheel had been pushed back to dent and crack the aluminium alternator cover. I removed it and found that the alternator itself looks to be ok. This is a picture of the front wheel from the other side. You can see that it’s hard up against the exhaust header pipe. So far as I can tell, no damage has been done to the exhaust mounting studs. I’ve worked my way from front to back of the bike to see what is saveable and what is junk. I’ll post that soon. Then I’ll put it up for sale and, if anyone wants it, they can make me an offer. There are some other parts that can go with it.